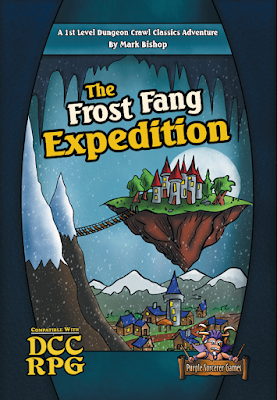 The Frost Fang Expedition is a 1st level adventure written by Mark Bishop. Art is by Mark Bishop and Jon Marr. Cartography is by Mark Bishop. The publisher is Purple Sorcerer Games. Disclosure: I have a "Proofreader" credit on this product. This product is an "Instant Action Adventure" which is intended to playable in a single session with minimum prep by the judge. Despite this, I recommend reading it through and doing your prep work, because it will make the adventure better if you do so. Mark Bishop (no relation) is a talented guy, doing writing, artwork, and cartography. Like his previous adventure, Nebin Pendlebrook's Perilous Pantry, The Frost Fang Expedition feels fresh, with a sense of whimsy that sometimes edges almost into horror. The encounter with Seleeshara the Demi-Patron is sheer brilliance, and is a thing I wish I'd written. Among the appendixes, the reader will find patron information for Malotoch and notes for linking this adventure to the aforementioned Nebin Pendlebrook's Perilous Pantry. If you have Purple Sorcerer's Sunken City Omnibus, you already have information on Malotoch, but, if not, it is good that they included it here. 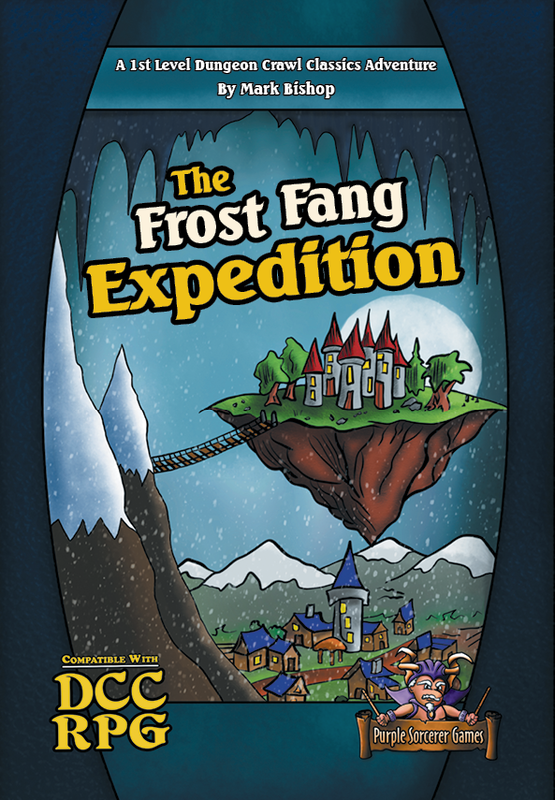 Like all Purple Sorcerer Games adventures, The Frost Fang Expedition comes with additional materals, such as judging tips, printable paper miniatures, spell sheets for Malotoch, and a whole plethora of printable images, maps, and handouts. Nobody does these sort of "value added extras" better than Purple Sorcerer.